Mr Martin Schulz, President of the European Parliament opened the Meeting: “I hope our MEPs show up and keep their promises. The promise of the EU was more social justice, more equality, more decent jobs. No surprise people doubt about democracy and justice in Europe. You are right, you must be loud, visible and audible. We are not ashamed of being poor, but of the existence of poverty“. These meetings were initiated as part of the agreed objective of the European Inclusion strategy “to ensure the direct participation of people experiencing poverty and social exclusion”. Delegations from 26 Countries exchanged with each other, with members of the European Parliament and policy makers on the growing gaps between the income available from work and welfare and the costs of a ‘basket of goods and services’ needed to live in dignity. “The economic and political vision, centred on austerity measures has resulted in the loss of people’s trust in their democratic institutions and is creating a deep economic, social and democratic crisis. Austerity measures have contributed to rising poverty reflected in official figures showing nearly 5 million more people in poverty and social exclusion since 2009. This once again shows that poverty is not an accident but the result of political choices” said Sérgio Aires, President of the European Anti-Poverty Network (EAPN). Commissioner for Employment Social Affairs and Inclusion, Mr Lazlo Andor addressed the meeting and acknowledge the lack of progress on achieving the EU poverty reduction target. He outlined key Commission proposals to reinforce the efforts to reach the poverty reduction target including the Social Investment Package with specific actions on child poverty, homelessness and adequacy of minimum income schemes. He also highlighted the agreement on the youth employment guarantee, the proposals to strengthen the use of the European Social Fund for social inclusion and the proposed European Fund for aid to the most deprived. The meeting was followed by a symbolic action that took delegates from the Commemorative stone for the victims of poverty on the Esplanade in front of the European Parliament, to the Place du Luxembourg, where all delegations showed the messages they had presented during the 12th Meeting, and called for an end to austerity policies. 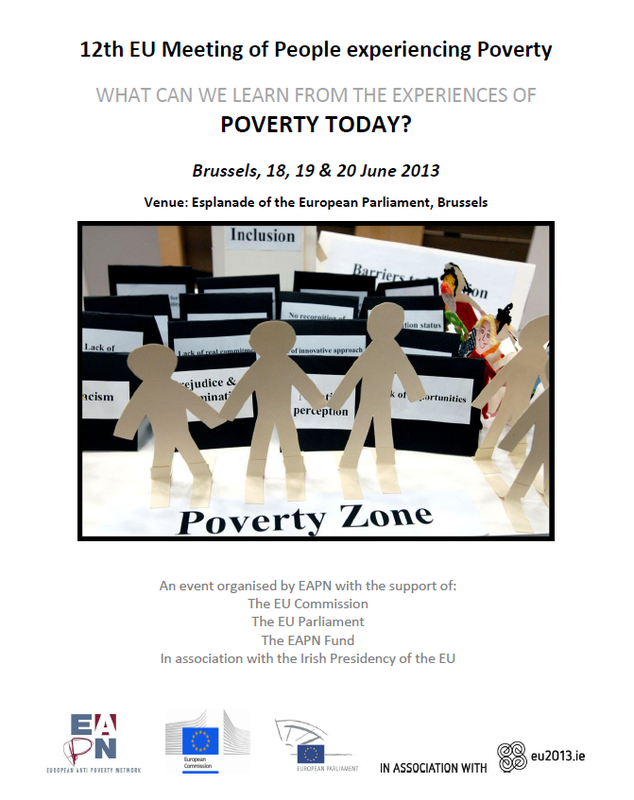 The European level People Experiencing Poverty Meetings must continue and give momentum to National level processes that ensure the participation of people experiencing poverty. This year’s meeting was an important contribution to the ‘2013 EU Year of Citizens’ and the continuation of the European Meetings of People Experiencing Poverty should be part of the legacy of the 2013 Year. There was a lot of work done to prepare for the 2013 meeting. A lot of important experiences, information and stories, were gathered together in the preparation reports that were shared both in formal and informal sessions at the meeting. It is important that the information gathered in this preparatory work is made visible as a follow up to the meeting. There is a harmonization of the costs of a decent life in the different European countries but still huge differences between wage levels and social welfare schemes and no real effort to ensure common efforts to reach high level social standards across Europe. This is creating a totally unbalanced Europe. Despite these growing differences, the processes which create poverty and the realities faced by people experiencing poverty have many similarities and we can learn a lot about how to address these difficulties form our exchanges. The response to the crisis is developing behaviours that undermine respect for human rights, such as: labour exploitation, xenophobia and increased discrimination, more waste in our societies (empty houses while having increased homelessness), growing distrust in our politicians and political institutions, criminalisation and negative stereotyping of ‘poor people’, while doing nothing to tackle the increasing concentration of wealth and power in the hands of a few. Youth unemployment is a big priority but unemployment and poor quality employment is also an issue for older people and for groups who experience discrimination. We don’t see any EU strategy on the ground to make the EU poverty-reduction target real. We call for a distinct EU strategy to fight poverty and social exclusion based on respect for fundamental rights and the participation of all relevant actors including people experiencing poverty. We demand an EU Directive on the Adequacy of Minimum Income Schemes and a common effort to ensure ‘living wages’. This is an efficient use of resources as the money will be re-invested in the economy to buy necessary goods and services and not left siting unproductively in savings accounts. The adequacy of income is very much linked to the access to services. Housing was identified as a key need and the importance of social and affordable housing was stressed as well as the need for accessible education and training and health care. Every person deserves to be treated with love and respect. We are not a number on a page we are someone’s mother or father, sons or daughters. To fight the ‘crisis’ you should stop fighting the ‘poor’ and start fighting for tax justice, ethical business practices and better redistribution of the wealth that is available.